When you want to share a family photo online, there are several different places you can put it. You probably pick your favorite form of social media and put the photo there. Or, maybe you post it on the social media website where the majority of your family members are. 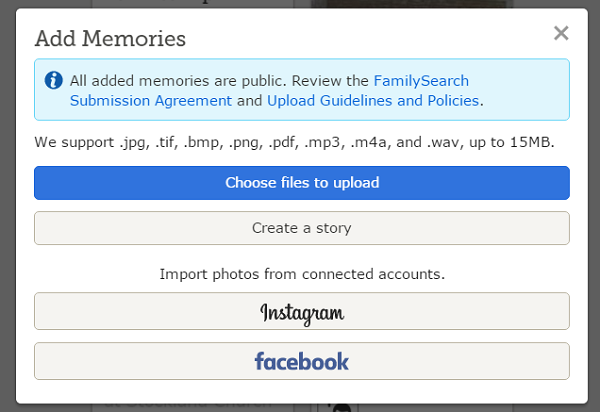 Now, you can import photos from Facebook and Instagram onto FamilySearch.org. Some people intrinsically understand exactly how to navigate through one social media website, find a specific photo that they placed there, and then put that photo onto a different website. Either the process feels intuitive to this group of people, or they are fast learners! Other people have a difficult time when they try and put a photo on social media. To this group of people, it is not very obvious what they need to click or tap in order to get the photo where they want it to go. There may be someone in your family who needs a little extra help to learn how to do that. Perhaps you are the one they call for help! FamilySearch has added a new feature that will make it easier for people to import photos into FamilySearch from either Facebook or Instagram. It will very helpful for FamilySearch users who have a Facebook account, or who have an Instagram account – or who have all three. To import a photo into Family Search, the first thing you need to do is sign in to FamilySearch. Select Memories in the top navigation. Next, choose Gallery. A green icon will appear that has a plus sign inside it. Click on that icon when you are ready to import a photo into FamilySearch. Clicking the green icon will cause a new window to open up. It will allow you to choose if you want to import photos to FamilySearch from your Instagram account, or if you want to import photos to FamilySearch from your Facebook account. You can do both – but not at the same time! You will have to log into the social media website you selected. You will also need to authorize that site to access your information in FamilySearch. Keep that in mind – just in case you want to revoke that access someday. Choose one of your photos on that social media site – and click “Import”. Right now, it is not possible to import a photo into FamilySearch by using the FamilySearch mobile apps. People who are using Edge and Internet Explorer 11 browsers may experience problems when they try and import photos.